There’s quite a mixed bag of movies out today. Between a bad reboot, a good sequel, and an epic 80’s moustache (seriously, how does Bryan Cranston do it? ), we also have a creepy local horror, and a re-imagining of the zombie apocalypse. While the latest remake of Ben-Hur has totally flopped at the box office, it’s actually not as bad as you’d expect. OK, yes the dialogue is hella clunky, the themes are super ham-fisted and the characters aren’t particularly likable. Um, wow it does sound like there’s a lot wrong with it, doesn’t it? But, the movie itself is absolutely gorgeous, the visuals are engrossing, and it comes across as earnest and sincere. Yes, it might not be the greatest movie ever, but it still gets enough right to be watchable. After breaking up with Mark Darcy (Colin Firth), Bridget Jones’s (Renée Zellwege) “happily ever after” hasn’t quite gone according to plan. Fortysomething and single again, she decides to focus on her job as top news producer and surround herself with old friends and new. For once, Bridget has everything completely under control. What could possibly go wrong? Then her love life takes a turn and Bridget meets a dashing American named Jack (Patrick Dempsey), the suitor who is everything Mr. Darcy is not. In an unlikely twist she finds herself pregnant, but with one hitch…she can only be fifty percent sure of the identity of her baby’s father. Like the character herself, The Bridget Jones movies have grown up. Far more mature than Bridget Jones: The Edge of Reason, Bridget Jones’s Baby has cut down on the silliness and stands as a solid entry in the series. It’s been updated to match more modern times, but it’s still comfortably familiar. If you’re looking for light-hearted sweetness and comfort, this is the movie for you. Based on a true story, Federal agent Robert “Bob” Mazur (Bryan Cranston) goes deep undercover to infiltrate Pablo Escobar’s drug trafficking scene plaguing the nation in 1986 by posing as slick, money-laundering businessman Bob Musella. Teamed with impulsive and streetwise fellow agent Emir Abreu (John Leguizamo) and rookie agent posing as his fiancé Kathy Ertz (Diane Kruger), Mazur befriends Escobar’s top lieutenant Roberto Alcaino (Benjamin Bratt). Navigating a vicious criminal network in which the slightest slip-up could cost him his life, Mazur risks it all to build his case. Honestly, I didn’t think too highly of The Infiltrator. That’s not to say it’s a bad movie, far from it, but it felt to me like they missed the mark. Good, but not great. 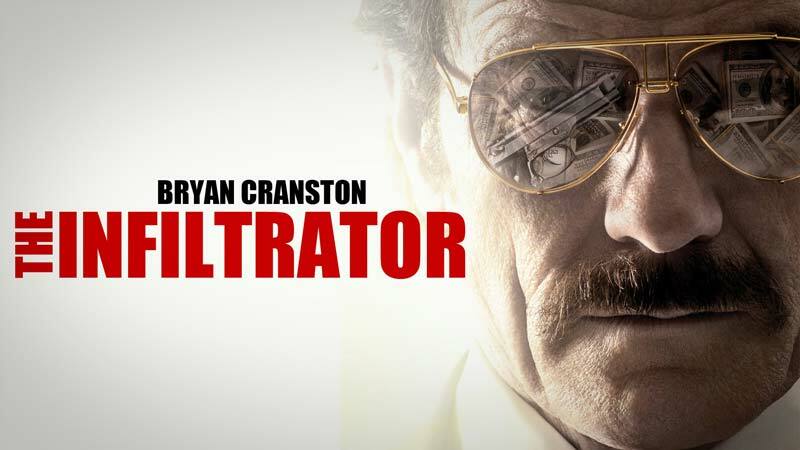 Luckily, Bryan Cranston is a delight to watch, his acting is impeccable as always. The story might have been super slow burning, but the Cranston and the rest of the cast were enough to keep me at least partially invested. The Actor is a thriller about an actor, who is a single father after becoming divorced from his daughter’s mother. In pursuit of his career he is made an offer to audition for the role of a man possessed by a demon. He decides to go the distance, hoping that the success it will bring will make him a hero once again in the eyes of his daughter. But what begins as light-hearted research into demonology soon turns into a nightmare when the character he develops begins to take over and the lines between acting and reality become blurred. The Actor genuinely tries to break the horror movie mould, and delivers with a creepy atmosphere and chilling soundtrack. So there’s more than just jump scares to look forward to. Unfortunately, the limited location, even more limited budget and often incredibly stilted dialogue let this movie down in a big way. That being said, it’s still a heck of an achievement considering what they had to work with. Information about Viral is pretty thin on the ground, but the few reviews I’ve found tend towards the positive. It doesn’t quite manage to reinvent the genre, but is smart enough, and creepy enough to give you more than your average brainless (sorry) zombie movie.